The MIDA Multi-Tool was originally one of the most powerful weapons in the base version of Destiny 2, and it remains one of the strongest weapons even after three major DLC releases. In this Destiny 2 MIDA Multi-Tool guide, we'll be walking you through how to get the MIDA Multi-Tool in Destiny 2, so you've got no trouble tracking down this powerful Exotic. Fore more help that isn't to do with getting the Mida Multi-Tool in Destiny 2, head to our Destiny 2 guide hub. It’s full of really useful info, including walkthroughs and more info on exotic weapons and armor in Destiny 2. In this guide to the Destiny 2 Mida Multi-tool,we'll explain what the Mida Multi-tool is, detail how you can get it, and give you tips to complete the various stages of the Mida Multi-tool quest. What is the Mida Multi-Tool in Destiny 2 and is it any Good? 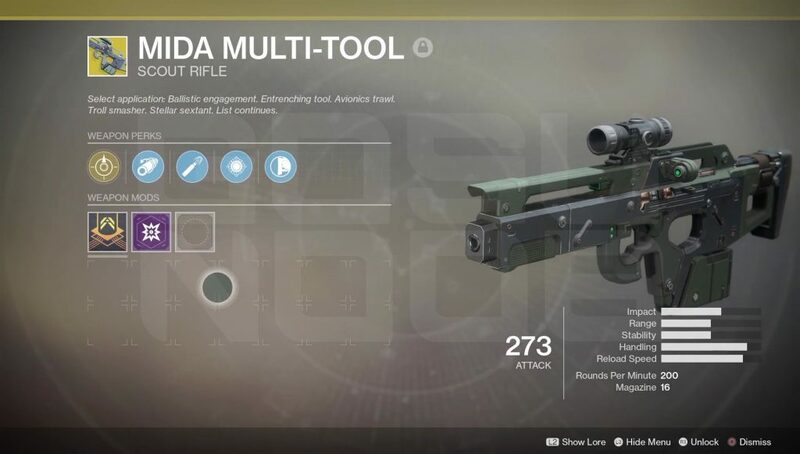 The Destiny 2 Mida Multi-Tool is an Exotic scout rifle that can be obtained in the game by completing certain tasks. It is a weapon that returns from the original Destiny, although in the original game you could get the Mida Multi-Tool from a random drop or a vendor. We’re not so lucky this time around. The MIDA Multi-Tool perks include an increased move speed and having the radar visible on the screen while you’re aiming down the sights. These can come in very handy indeed, especially when you have to keep an eye on your radar in the Crucible. MIDA Multi-Tool - Boosts your movement speed. Corkscrew Rifling - Slightly increases range, stability, and handling speed. High-Caliber Rounds - Slightly increases range, shots knock back enemies. MIDA Radar - Radar stays active while aiming down the sights of Mida Multi-Tool. Hand-Laid Stock - Increases stability, increases recoil control. To get your hands on the Mida Multi-Tool Exotic scout rifle in Destiny 2 you’ll need to complete a number of steps. We’ve listed the steps for you below, along with some advice on how to go about each successfully. Complete all these and the Destiny 2 MIDA Multi-Tool weapon will be yours. Complete the Destiny 2 main story missions and reach Level 20. Check out our Homecoming mission guide if you need help beating the main campaign. Complete all bonus European Dead Zone story missions that appear, ending with the Enhance mission. Head over to our European Dead Zone guide if you want to quickly get to grips with every activity in the area. This will give you the Mida Mini-Tool from Devrim Kay, a neat Legendary SMG. Go to the Tower and speak to Gunsmith, Banshee-44. Accept the Sight, Shoot, Repeat quest. To complete the Sight, Shoot, Repeat quest, all you need to do is take out 50 enemies with precision shots using a scout rifle. Perform multiple kills without reloading a total of 25 times. We'd recommend going for weak enemies like Thrall or Dregs for this, since you can easily take down one with just a few hits. Return to Banshee-44 in the Tower. Accept the Under the Hood quest. To complete the Under the Hood quest, you need to dismantle five Rare (blue) or Legendary (purple) scout rifles (simply head out into Strikes, Crucible matches, or Public Events to earn some scout rifles). Accept quest "The Fall Will Kill You". For the Fall Will Kill You quest, you need to kill 50 individual enemies while in the air. You can do this during missions or while exploring, so feel free to undertake any activity and go for weaker enemies with your SMG while you're airborne. Since you're going to the trouble of completing several quests to get your hands on the MIDA Multi-Tool, you can probably tell it's one of the better weapons in Destiny 2. Not only is it one of the better weapons in the game, but it also appears to be the weapon of choice for the elite Trials of the Nine PvP mode, as you're guaranteed to find at least 6 of the 8 total players carrying a MIDA on them in the fight. The strength of the MIDA Multi-Tool isn't just in its stopping power, but it's also a deadly accurate weapon. Since the MIDA doesn't have a whole lot of recoil and can fire fairly quickly, you can be sure to deal out massive amounts of damage pretty quickly, and you can also still keep an eye on your radar while aiming down the sites thanks to its perks, this coming in particularly useful during the Trials of the Nine mode. Well done! If you have completed all the steps, the Mida Multi-Tool is yours. Tick that exotic weapon off your list. Perhaps you now want to learn how to get the Rat King Exotic in Destiny 2 or how to get the Sturm exotic in Destiny 2? Or maybe you just want to learn how to best tackle the strikes in Destiny 2?